Tsodilo Hills is a rare and unique place with an atmosphere of intrigue and mystery. The word Tsodilo is derived from the Hambukushu word 'sorile' which means sheer. It is believed to be the site of first Creation by the Bushmen who painted more than 3500 rock paintings against the magnificent stone faces of the hills. Some of the paintings date back to around 800 to 1300 AD. Perhaps that is why the site is held sacred by the locals. The Tsodilo Hills have a special significance to the Bushmen who have been living here for thousands of years. 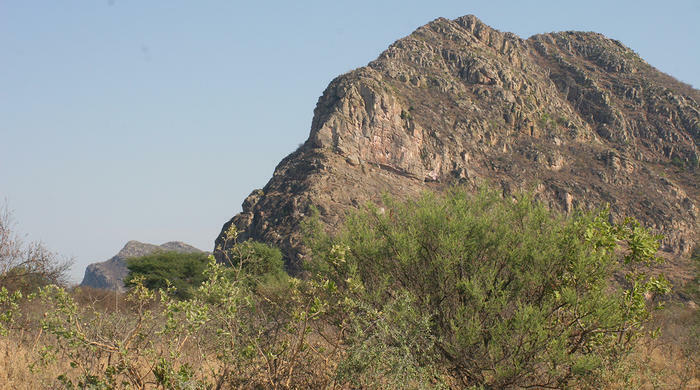 The Tsodilo Hills consist of four large pieces of rock, rising unexpectedly from the dry expanse of desert. The Bushmen referred to the bigger rock as the 'male', the smaller one was known as the 'female', and the smallest one was the 'child'. According to legends the fourth hill was the male hill's first wife, whom he left for a younger woman, and who now prowls in the background.The Bushmen believe the hills are a resting place for the spirits of the deceased and that their gods live in grottos within the Female Hill, from where they rule the world. The most sacred place is near the top of the Male Hill. Legend has it that the first spirit prayed after creating the world. It is also believed that these gods will cause misfortune and bad luck if anyone hunts or causes death near the hills. 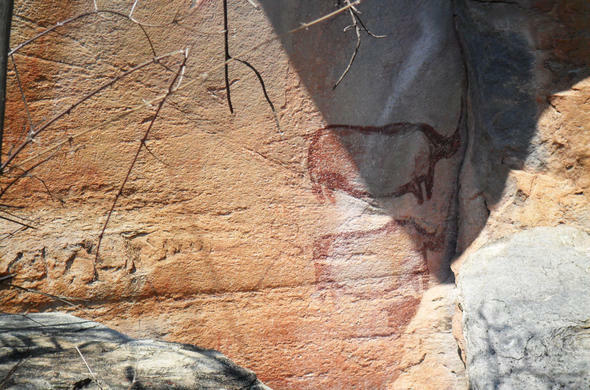 The Tsodilo Hills are one of the most historically significant rock art sites in the world, It boasts 500 individual sites representing thousands of years of human habitation. 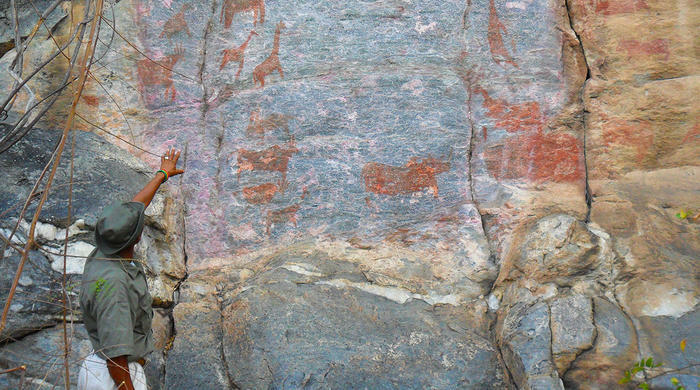 Nobody knows the exact age of the paintings although some are thought to be more than 20 000 years old, whilst others are merely a century old.There is a small Bushmen habitat nearby as well as a village near the Male Hill inhabited by the Hambukushu people. The thousands of rock paintings can be found by following different trails leading to over 350 sites. One of the more interesting paintings involves a Zebra on a small outcrop which is now used as the logo of Botswana's National Museums and Monuments. 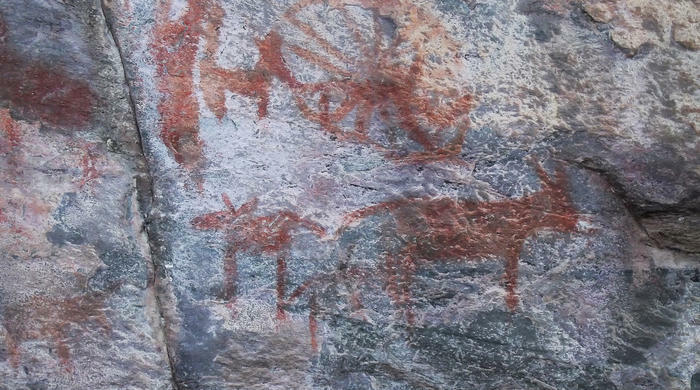 Certain paintings like those of whales and penguins suggest contact between the Bushmen and other people. Some even show a crowd of sexually excited male figures. You need quite a few days to thoroughly explore the extensive and exceptional rock paintings. Some of the paintings are the work of Bantu-speakers, although the Bushmen did most of the paintings. The people of Hambukushu believe that their god, Nyambe, originally lowered their tribe and livestock to earth on the female hill. Their supporting evidence are hoof-prints clearly etched into a rock, high on the hill. A logical explanation could be that these could be ancient dinosaur tracks or merely erosion marks. The Tsodilo Gecko is a small, nocturnal gecko with brown and yellow stripes and is very unique to Tsodilo hills. Apart from Kudu, Steenbok and Duiker, which have the ability to live in waterless areas, there is not much game in this area. Although leopard tracks can often be found in the hills, the predators themselves are seldom seen.Bird watching at Tsodilo Hills can be reasonable if you spend some time in the area, since most of the birds are found in the mixed woodland further away from the hills. Yellow billed hornbills, grey louries and Melba finches are some of the more commonly sighted species. The accommodation closest to the hills is at Shakawe: Drotsky's Cabins, Xaro Lodge, Shakawe Fishing Lodge or Makwena Lodge. There are no official campsites in the area so you may camp anywhere you like. Water may be drawn from a well near the airstrip. Tsodilo Hills can be visited at any time of the year. The dirt roads leading the hills are best after the rains, but many pans filled with water will need to be crossed. Climbing and exploring the hills and trails, seeing and appreciating the evidence of legends and ancient life. From Maun, take the main tar road to Shakawe, 370 km. The Hills are 40 km (4 hours) from Shakawe on an extremely rough dirt road.The turning off the main Maun/Shakawe road is just south of Sepupa and is indicated with a National Museum signpost. The track to Tsodilo Hills can only be negotiated four-wheel-drive vehicles. On the banks of Panhandle, 53km south-west of Shakawe in the southern corner of Botswana.